The rolled/rold gold jewelry is a different jewelry from gold jewelry, as rold jewelry is on which is made with filling gold or composing a solid layer of gold by bonding with heat and pressure on to a base that is usually made of other metals. Brass is mostly used for the rold jewelry. 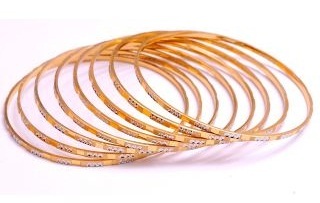 Bangles made form rold gold technique are comparatively less costly than the pure gold or 22 karat gold jewelry bangles. 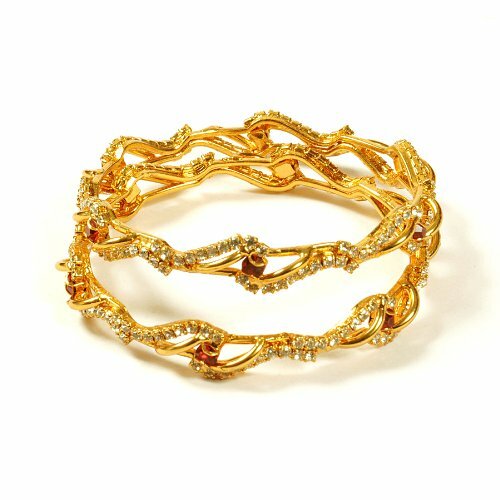 Rold gold jewelry is made with rolling out the sheets from which jewelry is molded and given form of bangles or other jewelry into shapes. 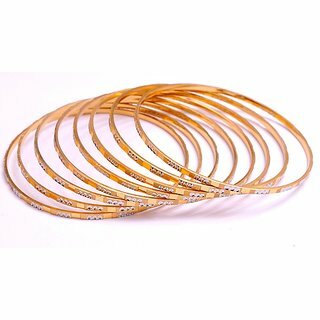 A beautiful set of rold gold bangles can be of the thin cut bangles with fine craft wok on it looks amazing. 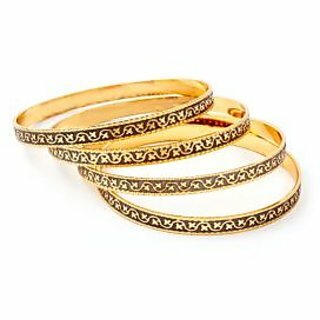 Bangles of the rold gold jewelry can be worn in regular days of work too, as the ratio of depreciation gets low compared to gold jewelry. 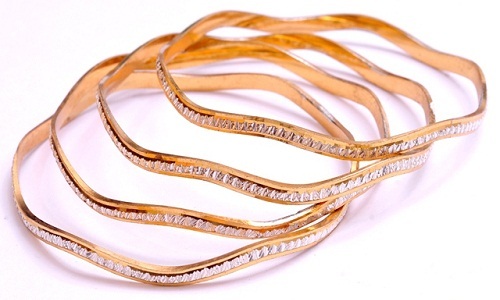 Rold gold bangles with an eye catching shape are the bangles with irregular round or say wavy shape of bangles. 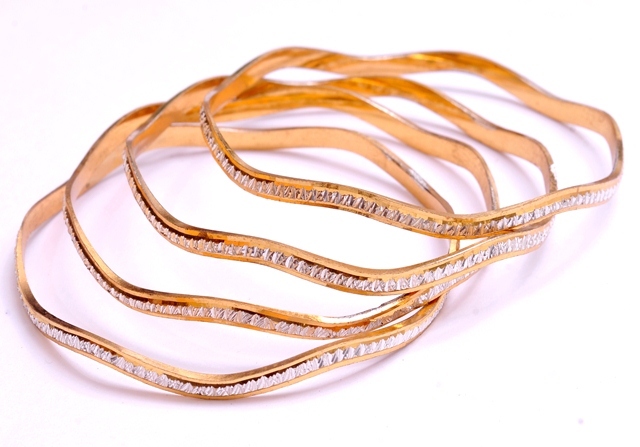 Beautiful work of cuts on the surface of the bangles looks like diamond work on it. 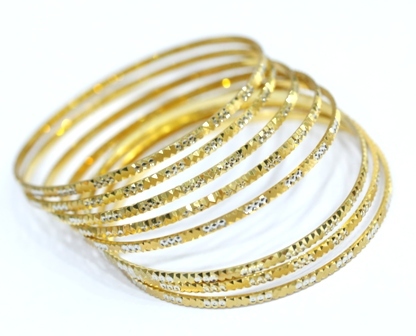 Rold gold bangles with gold and silver shades in them with beautiful craft work looks magnificent. The cuts on the bangles look amazing. 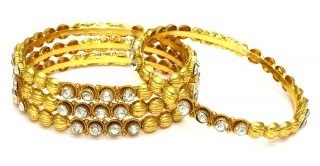 A set of 8 bangles for both hands will be perfect hand ornament. 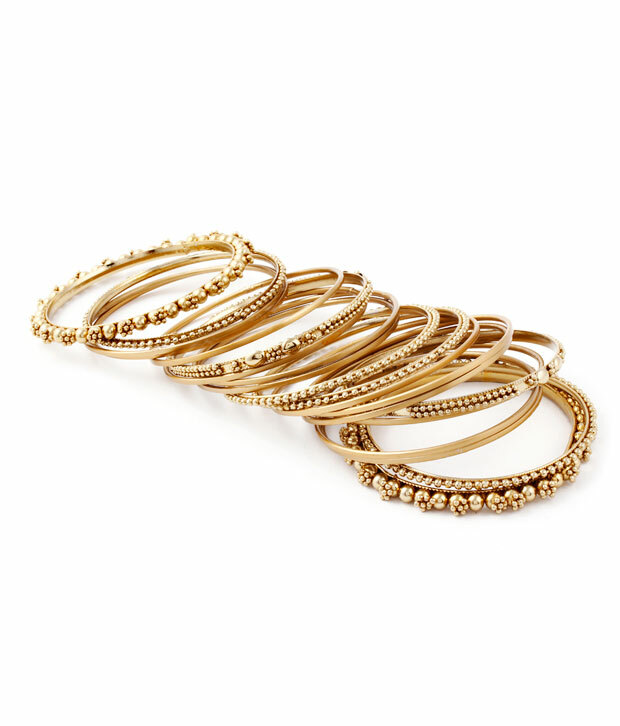 Rolled gold bangles models can help you choose beautiful bangles. A meenakari work of black color on golden designer bangles will definitely win lots of hearts. The black and golden design creates an eye catching impact. 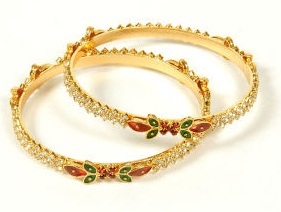 Beautiful craft work with amazing cuts and twists and turn with studding diamonds and rubies in the bangles is an incredible bangle set. 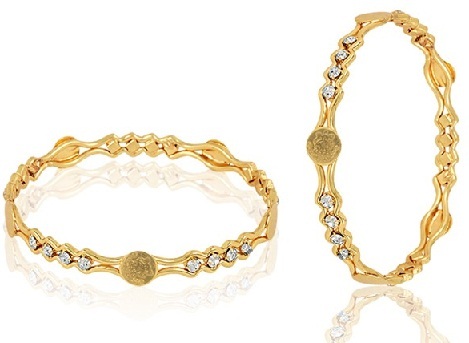 Rold gold bangle set with such a design is a must for every body’s collection. What a mind blowing idea of mirror work on bangles. 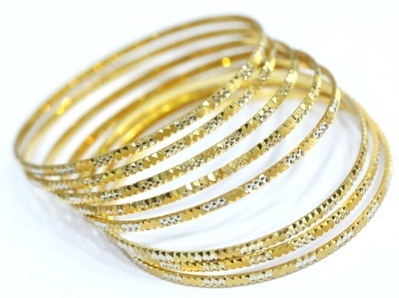 Such designs are easily available in rold gold bangle models. 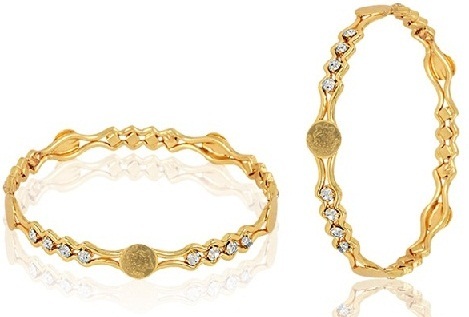 A set of four with such beautiful bangle set looks amazing. The golden touch with the mirror work will look good in all Indian outfits. 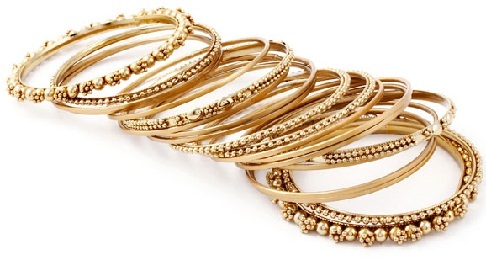 Antique designs in rold gold bangles are incredible craft work with a mixture of metals. The golden metal balls and floral work with fine art looks incredible and suits well on the hands of ladies. 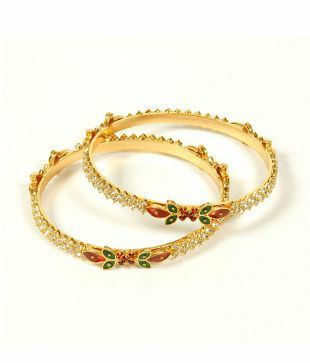 Diamond stud rold gold bangles will beautiful meenakari work. A temple with lace design and floral motifs in between looks brilliant. The shine of diamonds and beautiful meenakari colors incredibly glam your beauty. Amazing creativity with genie coins in rold gold bangles model. The brilliant shape and diamond stud with covering gold borders look excellent on hands and match awesome with any outfit. Metals such as brass or copper are largely used in rold gold jewelry. 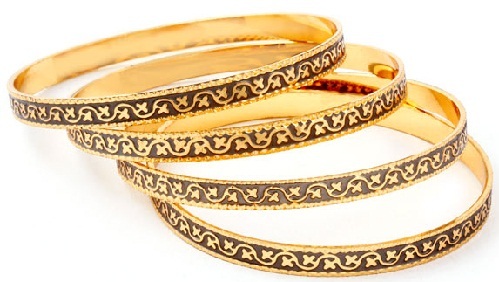 Bangles are largely made with rolled gold technique as the firmness received with the metals is helpful for a long time. A thin layer of gold that is wrapped around the metal gives the glittering ting to the jewelry. 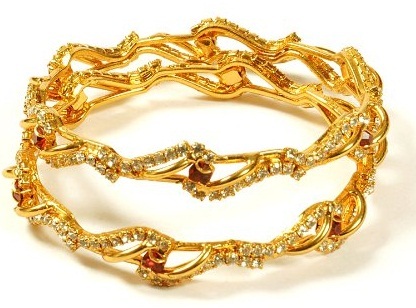 An advantage of rold gold jewelry is that it is not as expensive as the real gold jewelry. Beautiful collections in antique designs and unique designer bangles have a great impact in the jewelry world. Some very unique designs like the statement designs can be easily available in the rolled jewelry. Diamond studding and filigree work is also very easy with other metals. 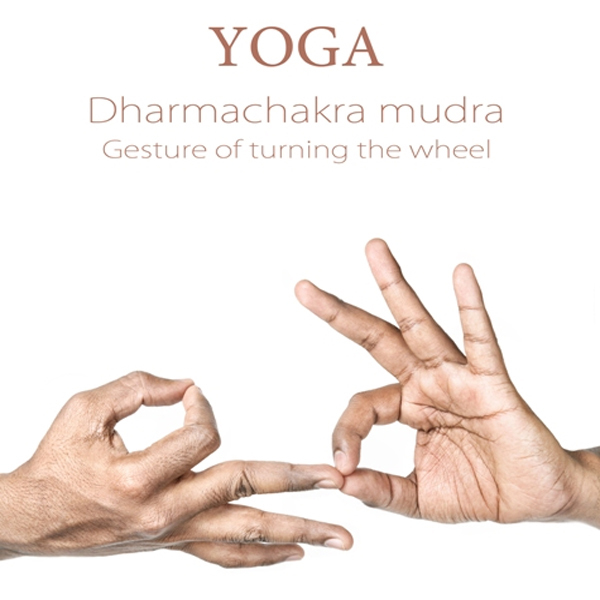 What Is Dharmachakra Mudra, Benefits and Steps To Perform?